From the creators of Ramsey's Revenge! Race is light rain or shine only. Refunds are ONLY available to those who purchase the optional $6 refund insurance. NO INSURANCE = NO REFUND if we have to postpone or cancel the event. The payout schedule for most MASS races can be found by clicking here MASS Cash Payouts. Registration/Check-in opens 2 hrs. prior, and closes 30 minutes prior, to class start time. 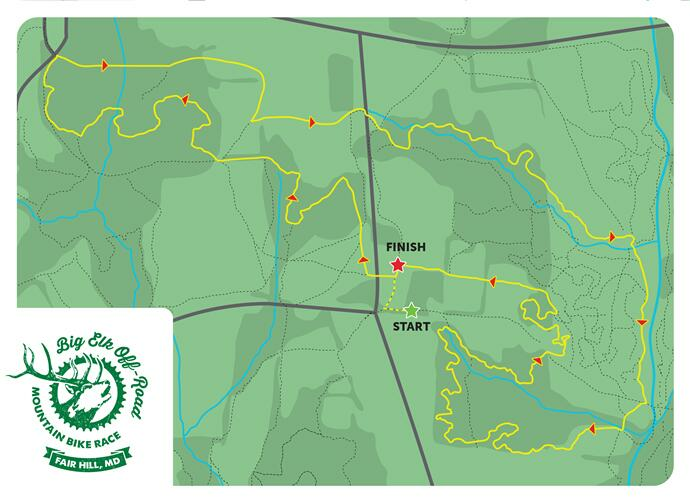 Parking, start, finish and registration will be on the east side of Gallaher Road, behind Big Elk Chapel. The course is fast and flowy, without a lot of technical challenge. It consists of a variety of terrain including tight twisty singletrack, wide open doubletrack, roots, few rocks, short punchy climbs, fast descents as well as some gravel and field trails mixed in that will speed things up and give ample opporunities for passing. It's a great cross-section of the variety east coast riding has to offer! We hope you'll join us for a fun day on trails at one of the Mid-Atlantic's most unique riding destinations! Endurance race is 4 hrs. and runs on the same course as the XC races. We will hold a kids race on a short marked loop on the event grounds near the start/finish. It will be held around 11:30-11:45. It's for kids 12 & under. Multiple heats for different age groups. An announcement will be made at the event about location and exact start time. There is no fee for this race. Race parking, registration, start and staging will be on the Gallaher Road event grounds, across the road from the Gallaher parking lot, behind Big Elk Chapel. Please do not park in the gravel lot. Park in the race designated areas only. Parking attendants will be at the entrance to guide you. I Don't Give a Fork - Serving delicious, easy-to-eat food! Big Elk is part of the Mid Atlantic Super Series (MASS) Cross Country and Endurance Series. Visit http://masuperseries.com/ for more information on the series. Pro/Cat 1 Open Women and Cat 1 Women 40+ will race together for the same cash payout but will be scored separately for the individual MASS competition. CAT 1 men will be awarded prizes.